The presidential election is one week away, but when it comes to investment plans that is not what is uppermost on the minds of Affluent investors. When asked in October which one factor most affects their current investment plans as they relate to their household’s portfolio, the largest percentage (28 percent) responded, “Stock Market Conditions” followed by “Retirement” at 20 percent. Only 8 percent said that the Political Climate was most affecting their current investment plans, which is on par with those who said the Economic Environment was having the most effect (9 percent). These responses are basically unchanged from three months ago when this question was asked of Affluent investors. At that time, 30 percent said that Stock Market Conditions were most affecting their household’s investment plans today, while 19 percent said it was Retirement. Three months ago, only 4 percent responded that the Political Climate was having the most effect on their investment plans. The four percent increase in October indicates that this presidential campaign, unprecedented in many ways can’t help but be on investors’ radar. Last August, Affluent investors overwhelmingly reported that news stories about the election were most affecting their economic outlook. This is not surprising as the 24-hour cable news channels have been reporting about little else in recent months. 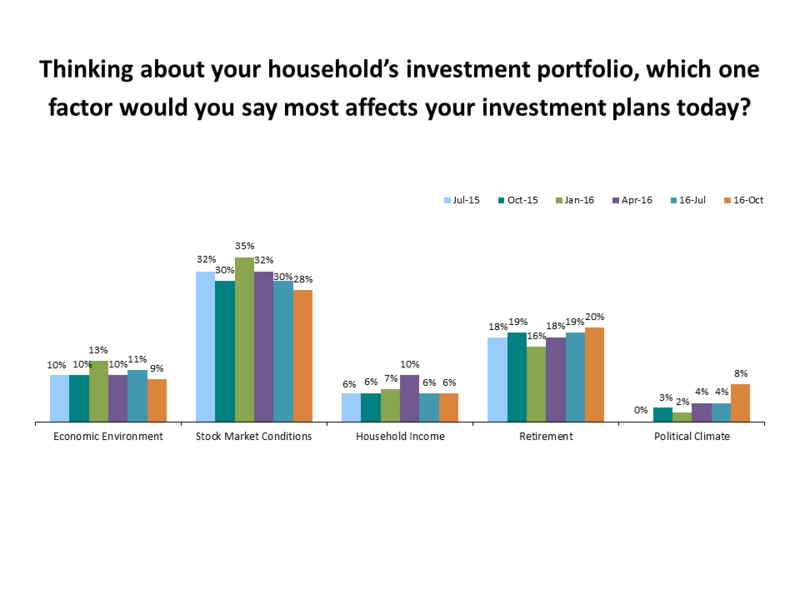 And in September, investors said they considered the political climate to be the most serious threat to achieving their household’s financial goals. This is a reflection of the perceived negative nature of the campaign. But when asked specifically about the factors most affecting their investment plans, Affluent investors are likely to tune out the distractions of the campaign season and focus on the bigger picture. Stock Market Conditions and Retirement are issues that have a direct impact on household income and assets. Financial Behaviors and the Investor’s Mindset, a Spectrem Group wealth research study, finds that a majority of Mass Affluent investors with a net worth between $100,000 and $1 million (not including primary residence) are concerned about being able to retire when they want. This percentage decreases to 39 percent among Millionaires with a net worth between $1 million and $5 million, but of those 39 percent, Millennials and Gen-Xers comprise just over half who express this concern. It will be telling in the next two months leading to the Inauguration to see how the election impacts the market and what impact this will have on the mindset of Affluent investors.